Missouri’s Right-to-Work (RtW) legislation, signed into law by Governor Eric Greitens in February of 2016, essentially states that no employee or prospective employee, with certain exceptions, can be required to join a union or to pay union dues or agency fees. But before the RtW law’s effective date on August 28th, well over 300,000 signatures were collected in opposition, which is believed to meet state requirements for a referendum on the issue. As a consequence, the law was put on hold, pending a vote in November. A casual look at a variety of statistics by state “right-to-work” status shows an impressive advantage for RtW states, though that doesn’t imply causality. One can certainly think of reasons why the causality might be operative, and I find some of them plausible, but that’s not the line of argument I want to pursue here. This may overstate the consequences for workers who would rather not join a union. Non-union workers have so-called Beck rights, which allow them to opt out of “core membership” and pay reduced dues covering only representation. An appropriate accounting for that portion of dues might not be straightforward, however, and it is still likely to represent an involuntary payment. Moreover, awareness of Beck rights is far from universal, and asserting them might not be straightforward. So, the NLRB is empowered to force employers, if it so chooses, to bargain collectively and even to rule on whether a vote by employees was “fair”. RtW laws are defended as a force to countervail against this federal power. The Wagner Act was later amended by the Taft-Hartley Act (1947) to curb union power and abuses. It created more balance in the relations between unions and employers and it offered some protection to non-union job seekers by prohibiting closed shops. It also allowed states to pass RtW laws to proscribe the forced payment of agency fees by non-union employees, if states so choose. Nevertheless, labor law continues to support monopoly union privileges and abusive tactics. Moreover, restrictions on unions’ use of dues and agency fees for political activities are difficult to enforce in the absence greater requirements for union financial transparency. The response from libertarian critics of RtW laws is that there are avenues for additional reform at the federal level without adding additional interventions (RtW) at the state level. Another side of the RtW debate is the contention that non-union workers receive the same benefits achieved via collective bargaining if they are employed by a firm having an otherwise unionized work force. 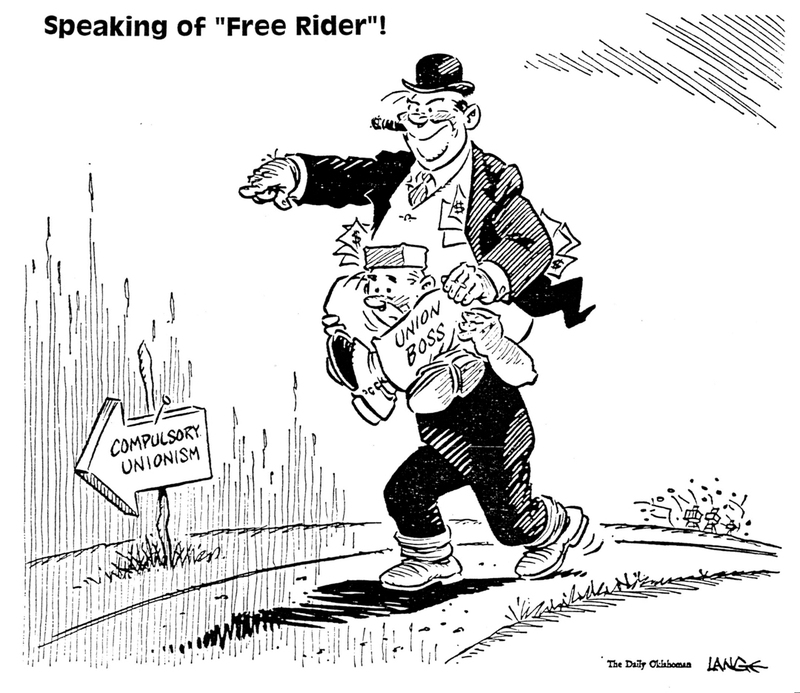 Thus, the non-union workers are said to be “free riding” on the union’s efforts. This framing is highly misleading, however. Under the Wagner Act, a firm’s non-union workers are not entitled to pay for benefits negotiated by the union unless the union has opted for exclusive representation. In that case, those non-union workers are not so much free riders as “compelled riders“, who may be forced to accept certain terms, working conditions and particular representation in grievances against their wishes. The union’s exclusive power is thus flexed in two ways: as a monopoly seller of labor to the firm, and as a monopoly seller of agency services to the worker, extracting dues or agency fees in the process. Union representation can protect workers from an imbalance of power between a large employer and individual workers. But it is not all sweetness and light for unionized workers, not to mention consumers who pay for the influence of unions on prices in general. While unions played a critical role in establishing and defending workers’ rights over the years, they have increasingly presented agency problems for their constituencies. They have also hastened declines in industries facing competitive pressures, which in turn have hastened the decline of union representation generally. (Public sector unions present a different set of problems involving conflicts of interest with taxpayers, but those are beyond the scope of this post.) In general, worker rights in the private sector are better served by allowing self-determination in the matter of union representation. To the extent that state RtW laws protect that autonomy, they are probably worthwhile at this point in the evolution of labor relations. However, if that is the primary effect, RtW is something of a misnomer.